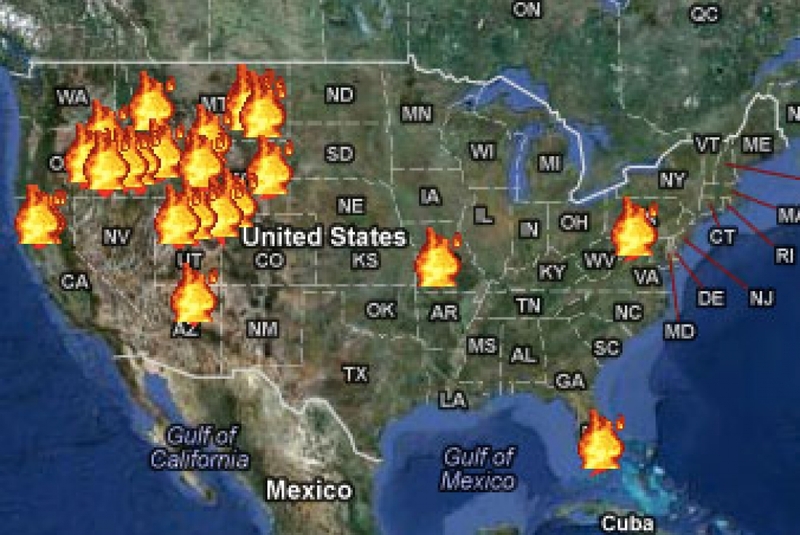 Screenshot from Climate Central's Interactive Wildfire Tracker. Click here to check it out. The 2012 wildfire season isn’t over yet, but already this year is shaping up to be the one of the worst on record in the American West. According to the National Interagency Fire Center, with nearly two months still to go in the fire season, the total area already burned this year is 30 percent more than in an average year, and fires have consumed more than 8.6 million acres, an area larger than the state of Maryland. Annual number of wildfires greater than 1,000 acres on U.S. Forest Service Land has been increasing. Click image to enlarge. 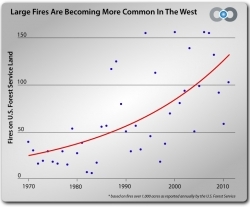 Yet, what defines a “typical” wildfire year in the West is changing. In the past 40 years, rising spring and summer temperatures, along with shrinking winter snowpack, have increased the risk of wildfires in most parts of the West. Studies show that continued climate change is going to make wildfires much more common in the coming decades. 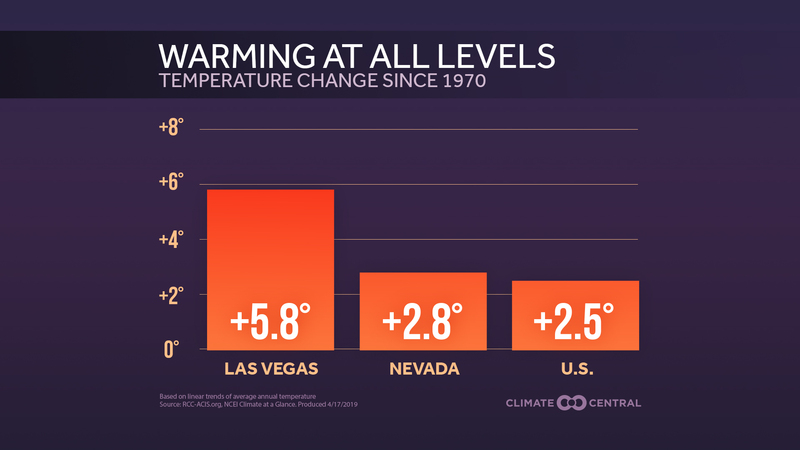 The National Research Council reports that for every degree Celsius (1.8oF) of temperature increase, the size of the area burned in the Western U.S. could quadruple. According to the IPCC 4th Assessment Report, summer temperatures in western North America could increase between 3.6oF and 9oF by the middle of this century. 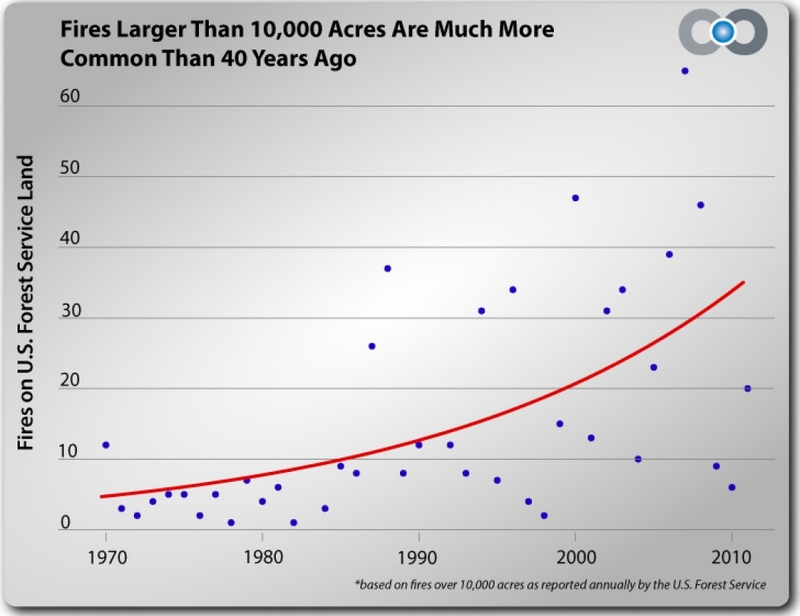 Wildfires larger than 10,000 acres are about seven times more common now than they were 40 years ago on U.S. Forest Service Land. Click image to enlarge. 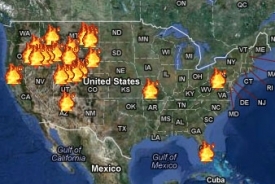 In some states the increase in wildfires is even more dramatic. 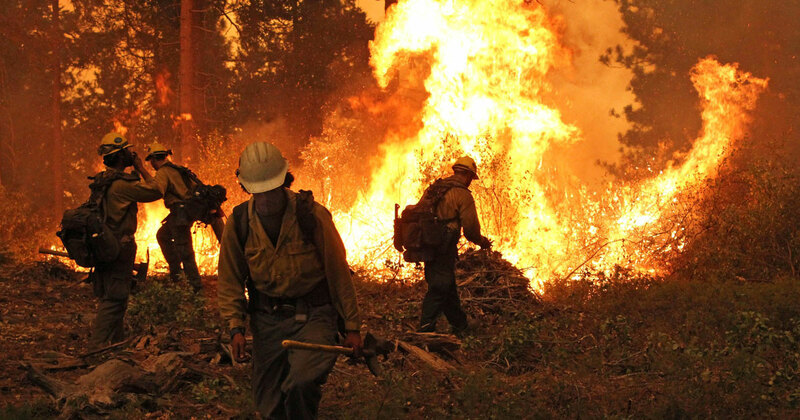 Since the 1970’s the average number of fires over 1,000 acres each year has nearly quadrupled in Arizona and Idaho, and has doubled in California, Colorado, Montana, New Mexico, Nevada, Oregon, Utah and Wyoming. 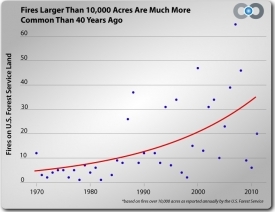 On average, wildfires burn twice as much land area each year as they did 40 years ago. In the past decade, the average annual burn area on Forest Service land in the West has exceeded 2 million acres — more than all of Yellowstone National Park. The burn season is two and a half months longer than 40 years ago. Across the West, the first wildfires of the year are starting earlier and the last fires of the year are starting later, making typical fire years 75 days longer now than they were 40 years ago. 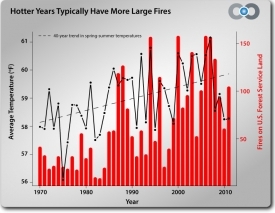 Average annual temperatures overlaid with number of fires. Click image to enlarge. 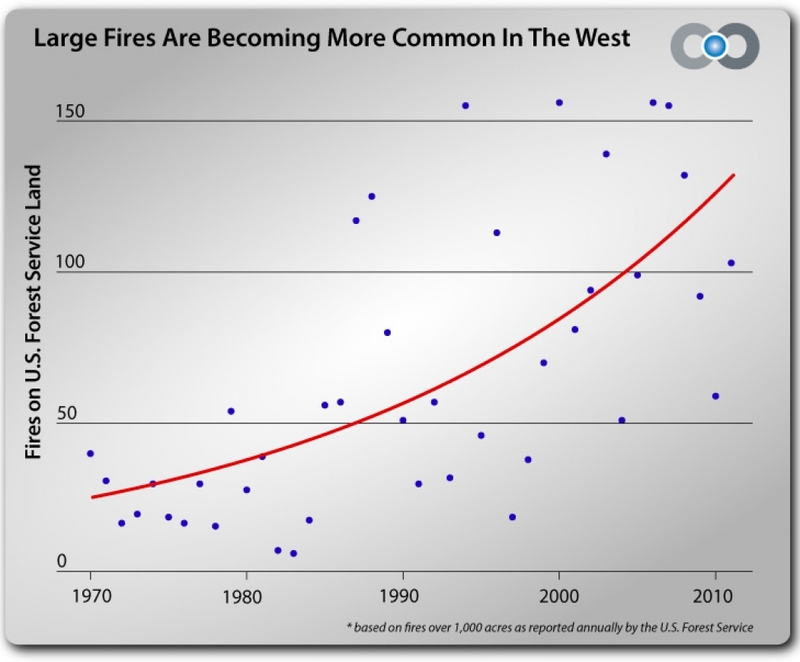 Rising spring and summer temperatures across the West appear to be correlated to the increasing size and numbers of wildfires. Spring and summer temperatures have increased more rapidly across this region than the rest of the country, in recent decades. 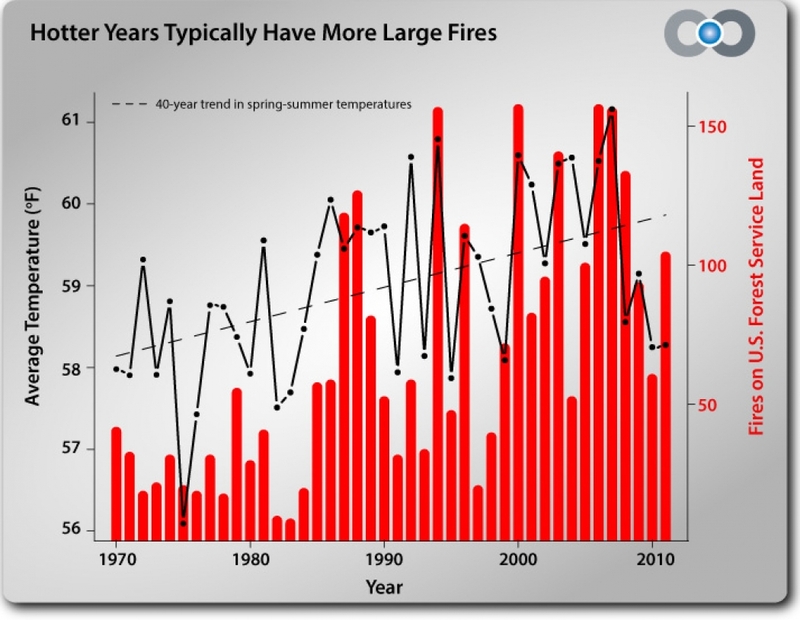 Since 1970, years with above-average spring and summer temperatures were typically years with the biggest wildfires. 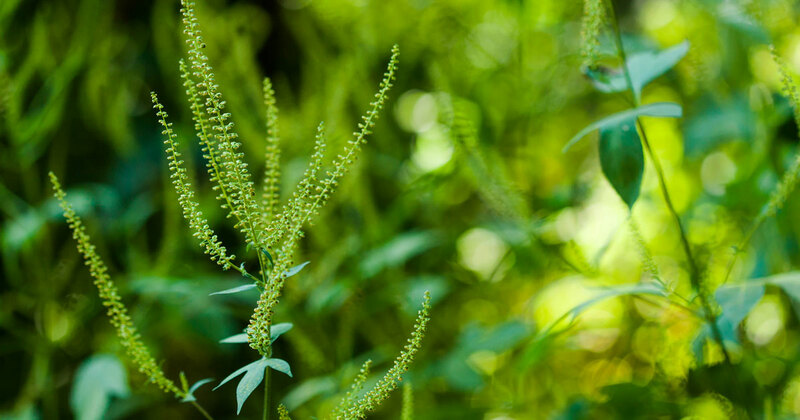 Previous research reveals that climatic changes, including increasing temperatures and the earlier onset of spring snowmelt, have been linked to increasing levels of atmospheric greenhouse gases and are likely influencing these damaging fire trends. As average global temperatures rise, researchers project that the risk of wildfires in America’s West will accelerate.